It’s time to start really talking Thanksgiving because the best way to make this holiday a success is to get organized. For the record, I’m defining success as a holiday with amazing food, good company, and most importantly a host who actually enjoys herself. Two things to think about way in advance are the menu and the task (greater for some than others) of cleaning out your fridge. The more clean storage and work space you have the happier you will be. More on the main menu tomorrow, but today, let’s talk snacks and starters. 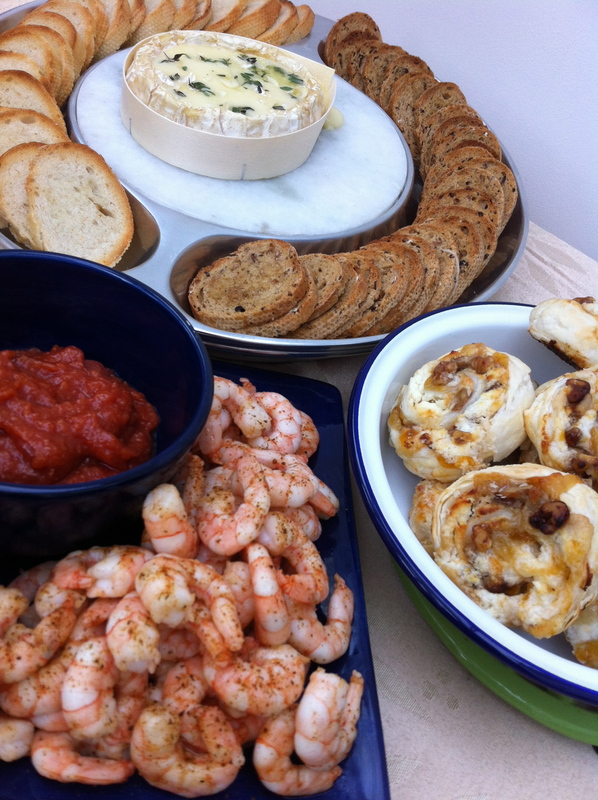 With any party I throw, a huge way to make a great first impression (while buying yourself time) is a few easy make-ahead appetizers. In the case of Thanksgiving, I want to keep it simple and not crazy decadent. Every year we do roasted shrimp cocktail (which we have to place away from my husband or he will clean the plate before anyone else gets a bite). 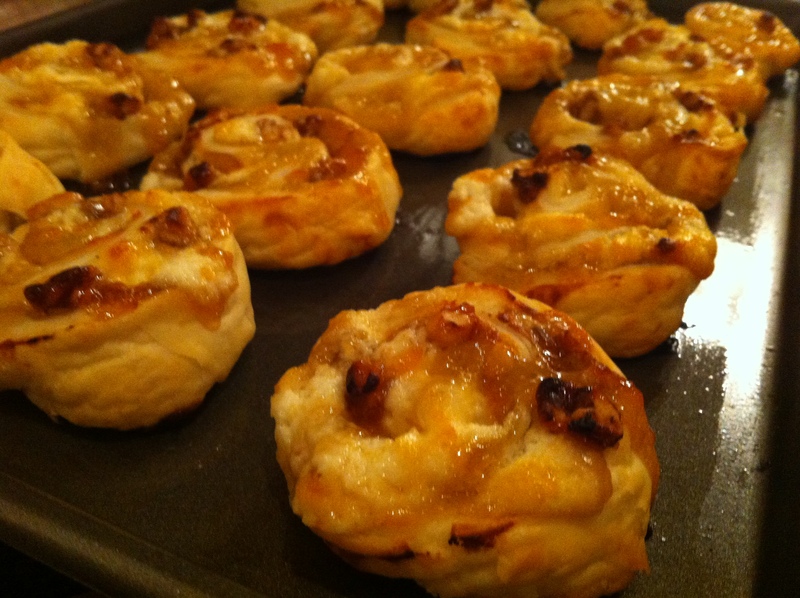 And this year I’m making a simple baked camembert and apricot goat cheese palmiers. These savory puff pastry bites can be made 3 days in advance, or you can even make them (minus the baking stage) and freeze them to have them on hand whenever. Just let them sit out at room temperature to thaw in the morning and bake just before your guests arrive. Just roll out shop bought puff pastry, spread with apricot preserve, cheese, and nuts. I also love doing these with fig jam and blue cheese. Just roll and carefully slice. Then bake for about 12-15 minutes. 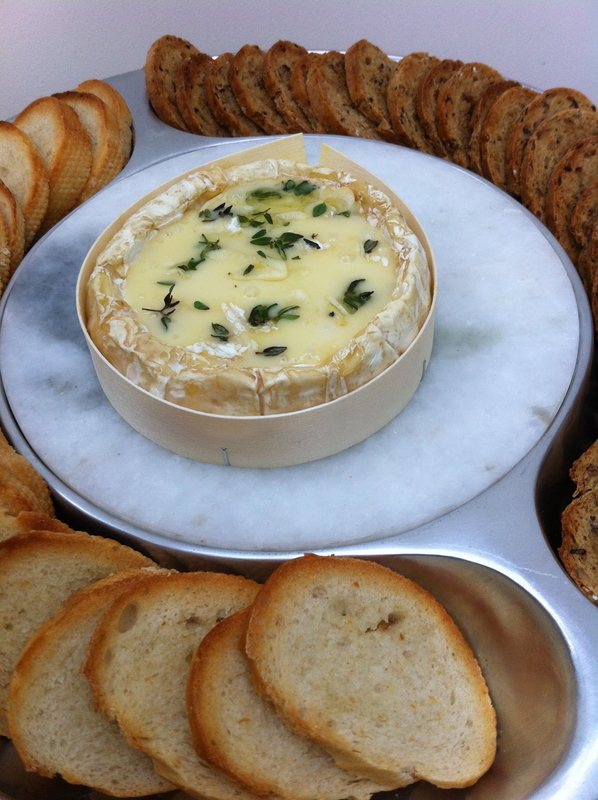 Another appetizer that will be a crowd pleaser and take about 5 seconds of your life is thyme baked camembert. It’s best to buy a round of camembert that comes in the wooden box. Once you remove the wrapping you can bake it directly in the box. Just score the top of the cheese to remove a circle of rind. 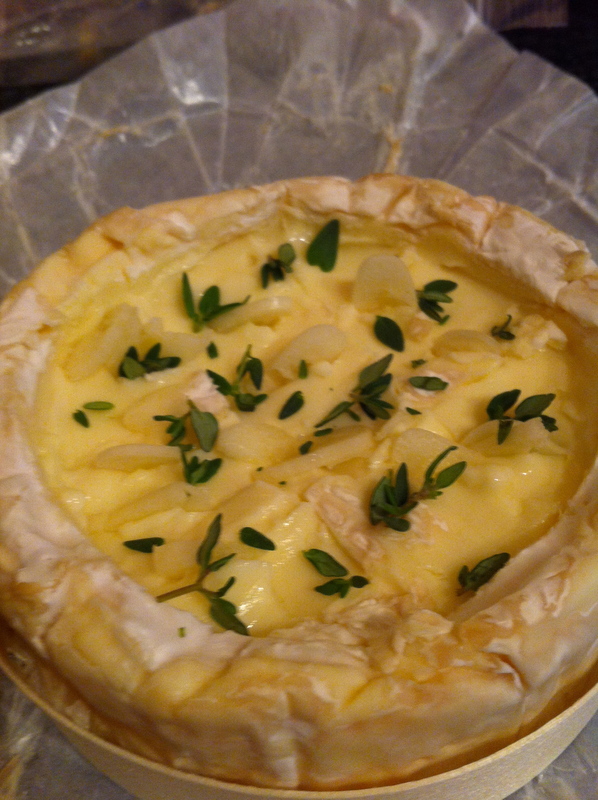 Use a knife to make little pockets into the gooey cheese and slide in thin slices of garlic and thyme leaves. Drizzle with a teaspoon of good olive oil and bake for 12 minutes until bubbly and cheesy and garlicy! Serve with sliced baguettes while it’s hot out of the oven. Note that you can make the cheese, place it back in its box, and cover the day before you plan to serve it. 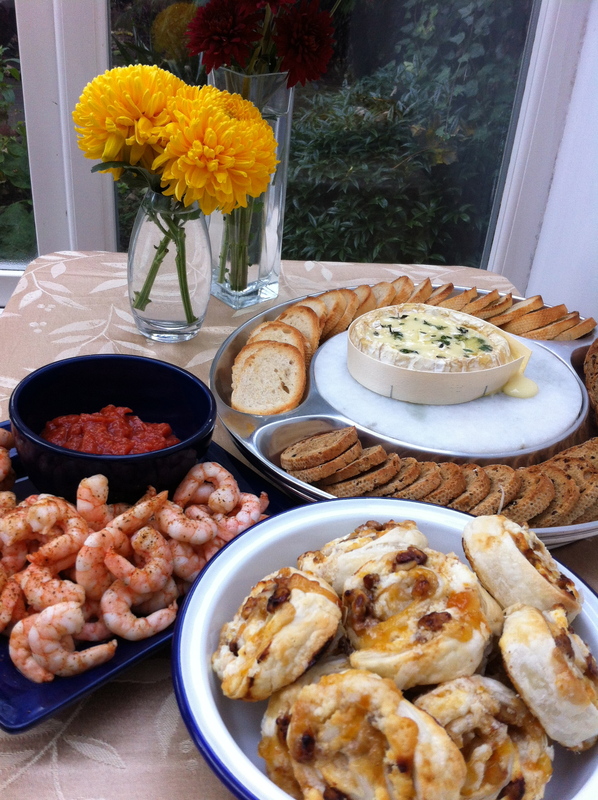 The baked camembert, along with apricot and goat cheese palmiers and roasted shrimp and cocktail sauce is the perfect way to greet your guests and kick of your Thanksgiving festivities. Another helpful hint: Even if you are like me and want to do all the cooking yourself, this is a great area to ask some guests to contribute. A cheese plate or crudite platter would be great and someone else bringing these things means more space in your fridge which will become crucial in the days to come, I promise. And have a couple pitchers of cocktails ready. Hopefully if the climates is chilly you can just set them outside (along with wine and beer and mixers) all ready to go for when your guests arrive. I’m making two super easy drinks: a ginger mint cocktail (recipe to follow) and Prosecco mixed with a pomegranate and elderflower cordial. Preheat oven to 400˚F. Grease a baking sheet and reserve. On a floured surface, roll out the puff pastry to about an 8″x12″ rectangle. Spread apricot preserve evenly over the puff pastry, leaving a 1/2″ space at one of the 12″ sides. 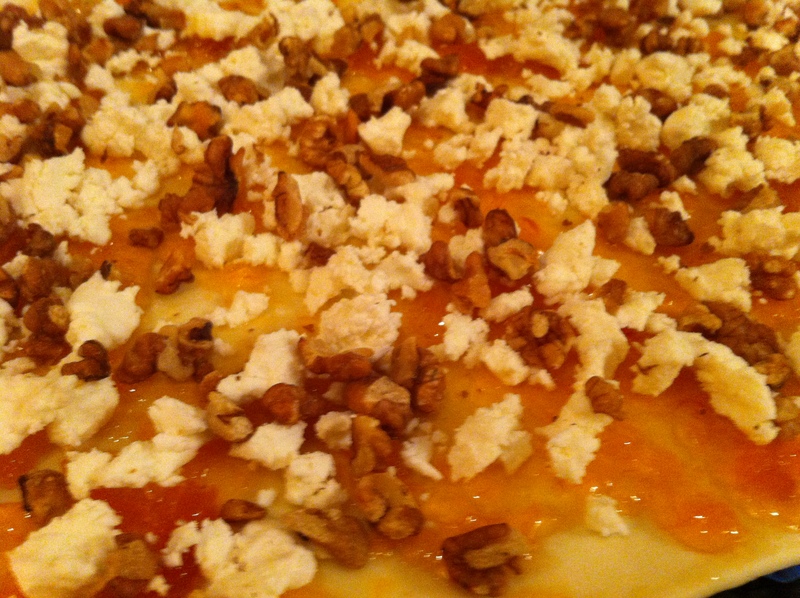 Crumble goat cheese evenly over the apricot and sprinkle with walnuts. Roll the puff pastry, starting at the longer end that does not have the 1/2″ without apricot. Seal the roll by brushing water on the open edge of pastry then press to seal. Slice into 1/2″ slices and place on the prepared baking sheet. 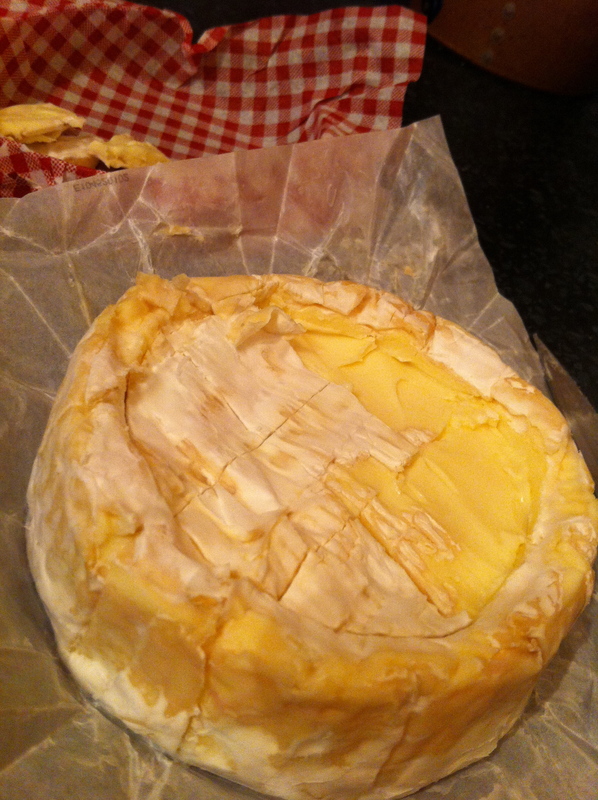 Cut a circle around the top edge of the camembert, about 1/4″ deep. Score the top of the camembert and remove the white rind of the top of the cheese, leaving a circle of the creamy cheese exposed. Use a knife to poke the garlic slices into the cheese. Repeat with thyme leaves, removed from stems. Drizzle with olive oil and bake for 12 minutes. Serve immediately with baguette slices or crackers. 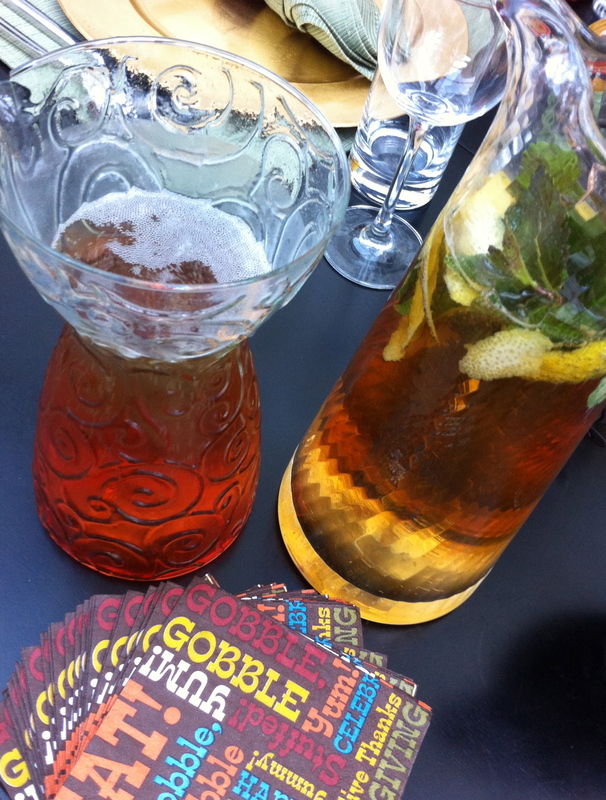 Pour ginger ale and bourbon into a cocktail pitcher. Add mint and lemon. Keep cold and let sit for 30 minutes before serving over ice.